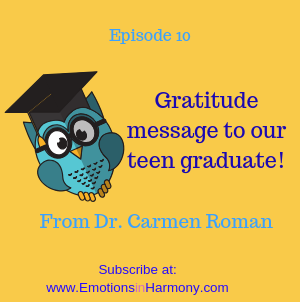 In this episode Dr. Carmen Roman talks to the teens who are graduating this year! She shares an inspiring and insightful message to those who graduated from elementary, middle or high school. This message is an excellent resource if want to revisit that adventurous and invincible spirit we all have during our teen years. If you are a parent, it may give you some ideas to talk to your kids about success and failure. • Dr. Carmen’s suggestions for a better experience in your professional life. Next Post¿Tienes tristeza o depresión?